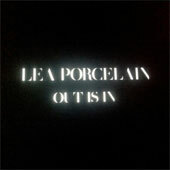 Lea Porcelain are a new duo from Germany who have released this debut online single themselves. There are three tracks. The first is Out Is In, which is a kind of industrial tune. There are loud thudding drums and overdriven guitar noise whirring, the voice echoed and bored. The beat really drives this along. The second track is not industrial at all. Snowstorm is a dense dreampop song with a whirring dense wall of guitar noise and light tapped drums. Over this the singer whines his words slowly. This is really beautiful in a way that reminds me of Adorable, or the more melodic elements of The Boo Radley's. The final track here is Box of Glass (featuring Pearl). Pearl is a female singer with a husky voice reminiscent of Claire Martial Guilhem from French act International Hyper Rhythmique. Pearl sings a duo with Lea Porcelain's vocalist, the two voices intertwine over some light guitar and tapped drums. It's a pleasant little song. Information online is kind of scarce about this act. For example, several sites list their management team, but not one lists the names of the two people involved. Whatever. It's pretty interesting music. I would like to hear more like Snowstorm please.